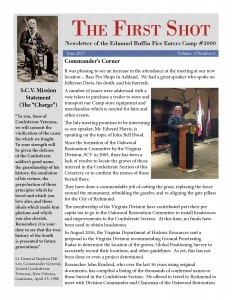 The June 2017 edition of the Edmund Ruffin Fire Eaters’ newsletter, The First Shot is now available. Download your copy here.. This is a reminder for those that contacted me to participate in the Color Guard for the Shockoe Hill ceremony Sunday June 4th at 2 p.m. Please remember that we have been asked to be there one hour early. We will be dedicating headstones for 35 Confederates, 8 Rev. war and 3 for 1812. We have already experienced some warm weather. I would recommend if you have a canteen, please carry it. If you don’t please consider putting a bottle of water in your haversack. There will be times when it is very warm and we will not wear shell jackets / Frock Coats. On warm days you may consider bringing your vest with you. We do not want anyone to suffer heat stroke. I know you may be anxiously awaiting a weird meeting reminder, with my usual shenanigans, jokes and making a fool of myself, which I thoroughly enjoy doing, even if no one else enjoys such jocular missives. to demonstrate that I am “semi compos mentis”, which is a polite way of saying “only half crazy”. UPCOMING JUNE 7, 2017 MEETING. If you have any questions about the new meeting site or this abrupt change, contact Commander Joe Wright, Adjutant Walter Smith, 2nd Lt. Commander Willie Wells, 1st Lt. Commander Joe Howard, or Matron of Honor Judy Smith, who are all knowledgeable about this shift in location. My compliments to Commander Joe Wright for his strong leadership efforts to secure a new meeting venue for our Camp on short notice. The fact of the matter is that Anna’s Italian Restaurant advised us that due to low attendance at the Fire Eaters meetings this year, they are booking larger parties in the meeting room, and that we needed to vacate beginning with the June meeting (they have already booked a 75 person group on June 7 to attend a party in the meeting room). As a result, Commander Wright promptly searched for an alternate site, requesting input from the Executive Committee. Those members who have been with the Camp for a while will remember that we used to meet at the Bass Pro Shops, until we started getting too large for their meeting room to accommodate us. There is a decent restaurant at this location, where we can dine and enjoy fellowship and socializing. I hope this information is not confusing for anyone. The situation is that we can no longer meet at Anna’s Italian Restaurant, but will now go back to meeting at the Bass Pro Shops (which you can see from I-95), which have everything we need to continue our members, guests, Friends, Associates, the Ladies and visitors. So if you have your car computer or GPS programmed to take you to Anna’s, you need to override the infallible computer and make a U Turn to head over to the Bass Pro Shops, where we are fortunate to have a restaurant as well as a good private meeting room. See y’all joining me in circling around Hanover County looking for the Camp #3000 meeting! Not!!! See you at the Bass Pro Shops on June 7, 2017, at 6:00 p.m. for dinner, and 7:00 p.m. for the formal meeting.